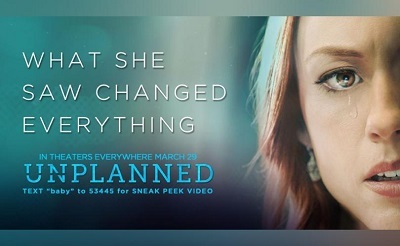 The movie about Abby Johnson’s pro-life conversion has found a distributor and will be coming to 800 North American screens in March. The film’s backers have released a two-and-a-half-minute trailer of the much-anticipated film. Pure Flix, the distributor for God’s Not Dead, is releasing Unplanned on 800 movie screens March 29, the Hollywood Reporter (THR) reports. “I thought I was helping women,” said Abby Johnson, founder and director of And Then There Were None, an organisation that helps abortion workers exit the industry and find new jobs. In the trailer, Johnson’s character is warned by Planned Parenthood that by crossing to the pro-life side she’s made an enemy of “one of the most powerful organisations on the planet”. Actress Ashley Bratcher (War Room, 90 Minutes in Heaven) who plays Johnson, told the Fox & Friends programme in December that she had been warned that she would probably be blacklisted for acting in the movie. The $6-million (R81-million) cost for making Unplanned was financed in part by Mike Lindell, the multimillionaire founder of My Pillow, who invested $1-million (R13.5-million) in the film. Lindell, a pro-life Christian, told THR he plans to continue supporting films that represent his values. In addition to Bratcher, the movie stars Brooks Ryan as Johnson’s husband, Doug; Robia Scott (CSI, Buffy the Vampire Slayer) as Johnson’s superior at Planned Parenthood; Emma Elle Roberts (Hunger Games: Mocking Jay, I Am Not Ashamed ) as Marilisa Carney, Kaiser Johnson (Little Boy, Vampire Diaries, Sleepy Hollow); and Jared Lotz (Of Little Convenience, Thanksgiving) as 40 Days for Life President Shawn Carney.